This is my signature getup. 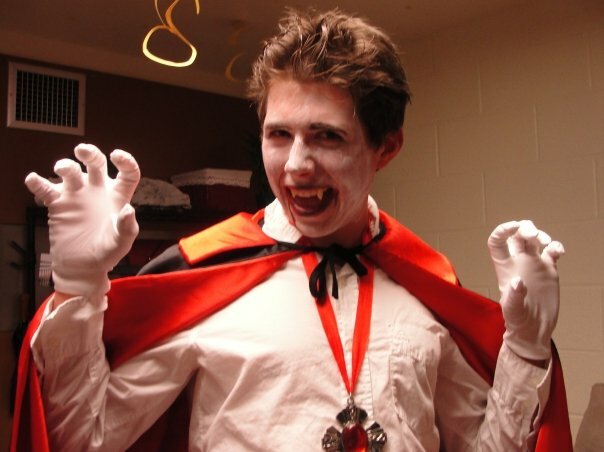 Stalk Facebook – and even MySpace – and you’ll see I’ve been a vampire since before Edward Cullen was a thing. I also don’t do it like the simpletons aka wear Dollar Tree fangs. No, kids, I use dental adhesive. I also have a cape, gloves, and some Renaissance-esque medallion – we’re talking Anne Rice vampires. On the topic of that dental adhesive, I even made out with someone with those incisors, and they didn’t fall out (!! ), though I can’t imagine I tasted very good. This was by far my favorite costume, but the one that received the most criticism because apparently I dress like a French painter in everyday life. (Is it bad I take that as a compliment?) Admittedly, the only thing I bought for this outfit was a watercolor set. And I stole a cardboard box from a dumpster to make a palette and used some computer paper for my cig. But I never would have paired those yellow pants with that striped shirt any other day. Okay, maybe. It’s hard work being a hipster. This one was last year, and I never made it out of the house because #selfdoubts. Basically, I wrapped myself in a toga (read: bed sheet – though it was a green sheet, because that’s different) and a bought a Dollar Tree wreath for my laurel and even some plastic grapes. The final touch was a handheld mirror. And then everyone was like, “It’s Halloween, not a toga party.” And I was like, “Does no one remember reading Edith Hamilton’s Mythology in seventh grade? I’m Narcissus!” I also didn’t know if my pecs were in prime condition for the wintry night, so I changed into zombie attire. I’m trying to bring Narcissus into the modern age. I’m also afraid I’m just too highbrow for people. Or I overthink costumes. Who is the Vain man, you ask? Well, he’s the one who walks like he’s on a yacht. He has a hat dipped strategically below one eye, and he has an apricot scarf! You probably think it’s you, don’t you (don’t you)? Oh, so you don’t think anyone will get it? “How To Lose a Guy in 10 Days” came out in 2003, though. Okay, I guess I won’t be the Vain Man this year. I haven’t pulled off this costume either, but I think it’s brilliant – and if that’s not a red flag, I don’t know what is. The idea is you wear those toe shoes that they’ve proven are worthless , a tank top that has sleeve openings down to your hips, an iPhone strap around your biceps, and you put a bandana around your forehead. You also have to haul around a gallon of water. Bonus points if you refuse alcohol on Halloween because #gains. I would do this, but I eat bread, so I’m not sure I want to show my abs. So now I have two weeks to figure out how I’ll stun the masses on All Hallow’s Eve. Any ideas?